This illustration indicates where to find Mt Fuji on a clear day. 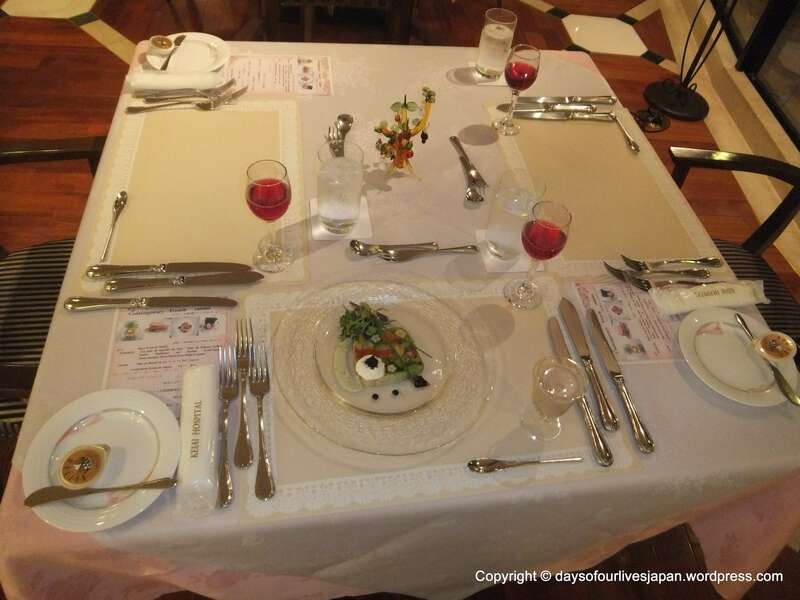 I mentioned yesterday that meals are served in the Fuji View restaurant. 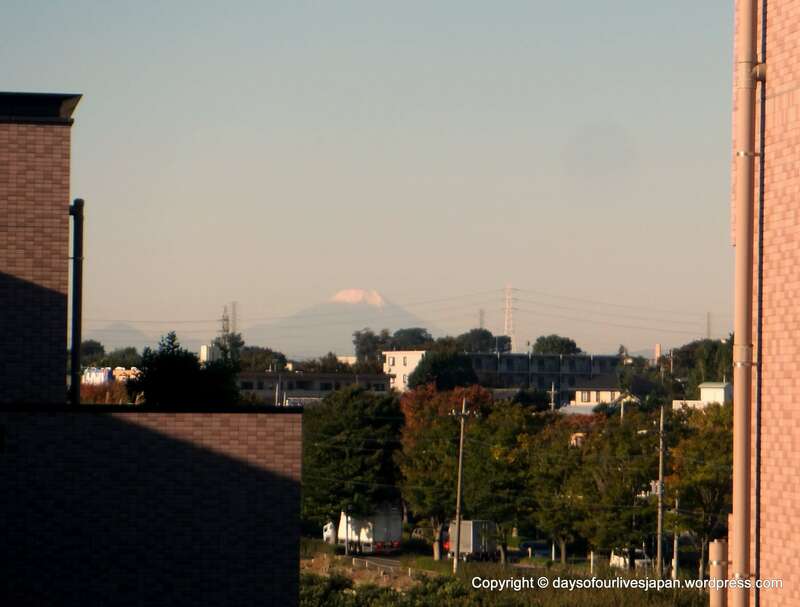 It is so named, because on a clear day you can see Mt Fuji, which is about 160kms away from the hospital! 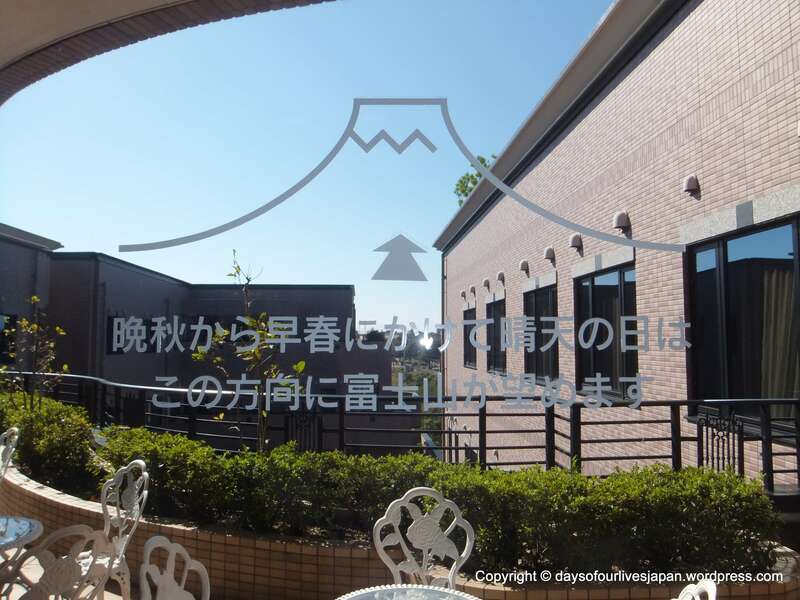 The photo above shows you where in the window to look for Mt Fuji. I couldn’t see it in the afternoon on day one, but I sat with it in view on day 2, photo below. 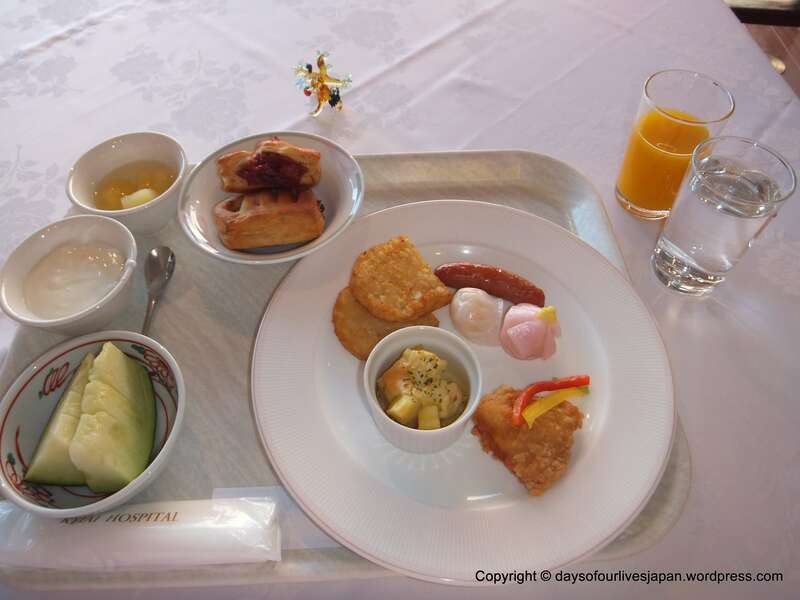 After breakfast I got to choose a present from a selection displayed on the 4th floor. 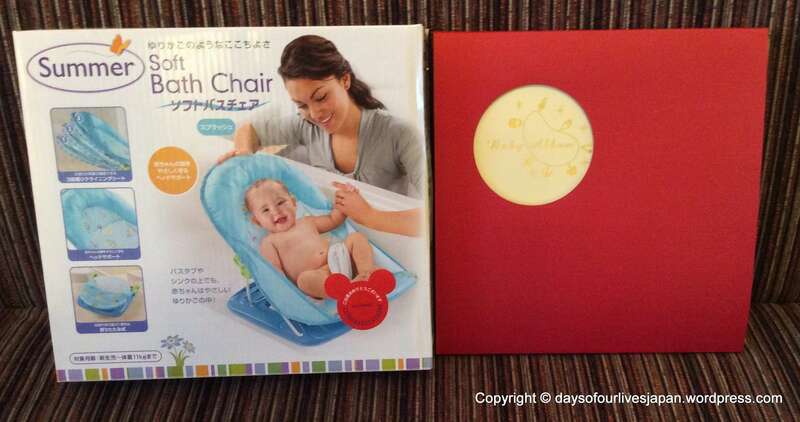 I chose the Summer Soft Bath Chair and a “baby’s 1st year” album. 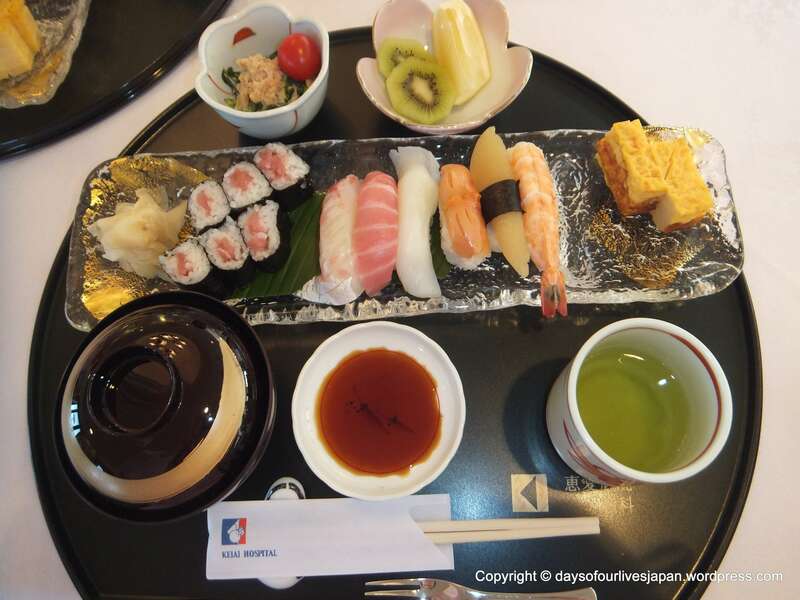 Lunch on day 2 was sushi. More sushi was brought throughout the mealtime. After lunch we had a meeting about getting discharged on day 4. We received a light snack during the meeting. We were presented with a bag of goodies. The contents of the bag of goodies! 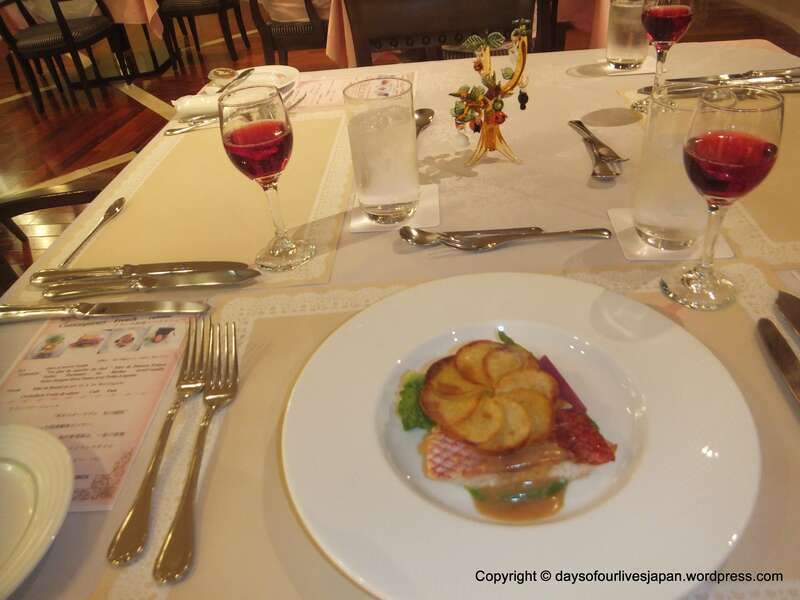 The very delicious dinner on day 2 was Contemporary French cuisine served with cranberry juice. 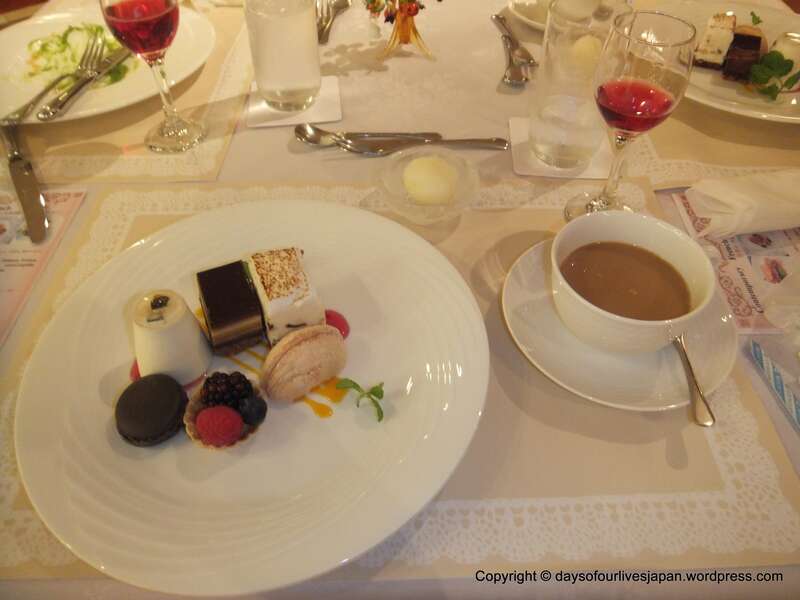 This was my personal favourite out of all the meals, not least because the dessert was an explosion of sweet delights. 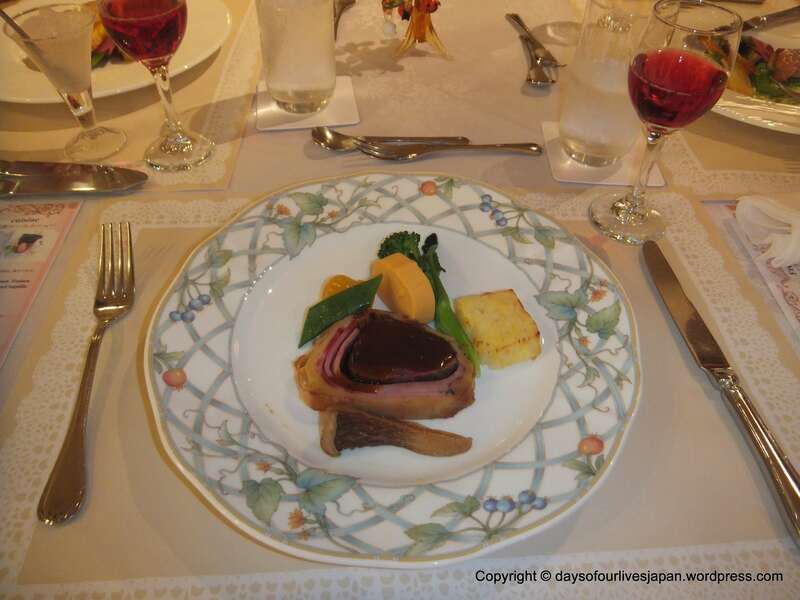 I didn’t get a photo of the 3rd course “Parfumee au Herbes avec Coquille Saint-Jacques Deux Sauce avec Petits Légume! Contemporary French cuisine. Hors d’oeuvres. After dinner, having thoroughly enjoyed my massage in my room in the morning, I decided to leave LO#4 in the baby room to try out the electric massage chairs. 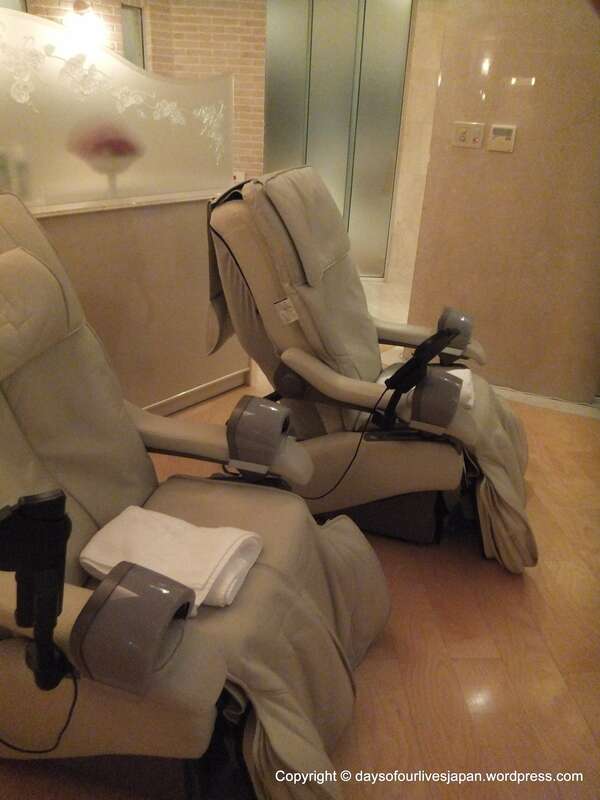 These are housed in the “Refresh Salon” on the 3rd floor where you have your shower. They have had this facility since I had my first child 5 years ago, but I never made use of it until this stay. After “refreshing” I picked baby up from the baby room and we went back to our room for the night. A nurse pops in every night at 9pm to see if you are alright. I must have drifted off after feeding little one as when I woke next it was close to midnight! The end of a very enjoyable day. 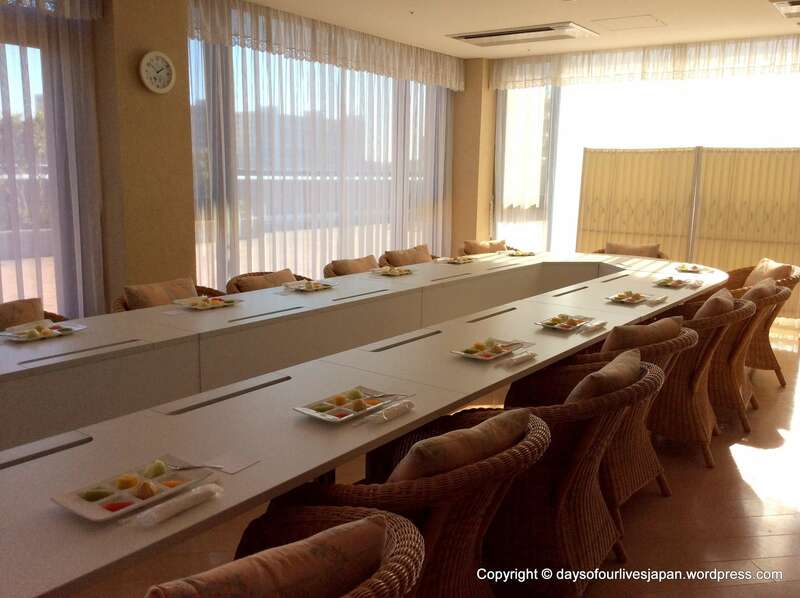 🙂 THE OFFICIAL WEBSITE FOR KEIAI HOSPITAL IS: http://www.keiaihospital.or.jp/ FOR INFORMATION IN ENGLISH, WRITTEN ON THIS WORDPRESS BLOG IN 2012: Keiai Ladies &#8220;Hotel!&#8221;, Saitama. General Information Disclaimer 2015: I had the most wonderful birthing and pregnancy experiences on all four of my children at Keiai Hospital between 2009 and 2014. However, I always recommend that you check that a hospital matches your personal needs and wants for pregnancy and birth before signing up to it. Sounds fantastic! I lived in China a few years ago, and was scared to death to get pregnant. It looks like pregnancy in Asia isn’t that bad. I guess in Japan I it’s ok for pregnant women to eat raw fish? Yes pregnant women and nursing women continue to eat raw fish. Actually, in my experience, there is very little they tell you not to consume, even coffee (in moderation) is okay. They do advise against cigerettes, alcohol and medication. I’ve been reading some blogs about birthing around the world and it is amazing how different various countries and customs are. I feel lucky to have given birth in such a good hospital, but there are some real horror stories within Japan too. 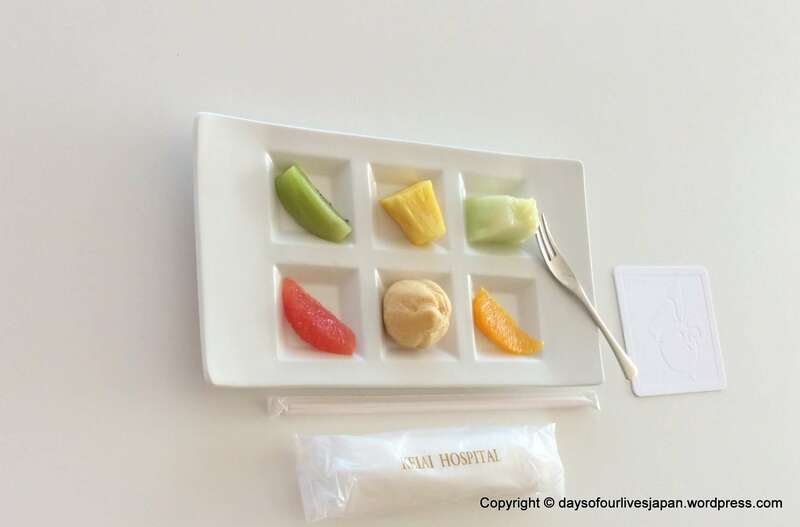 Wow, so lucky and luxurious! I definitely feel lucky to have found such a wonderful hospital to give birth. 🙂 Thank you so much for commenting. So ok. It looks good. But if you have one of those all night babies who needs to be paced around the hospital all night and only sleeps during the day how does it go down? When do you you sleep with all those lunches and meetings going on? I can answer this, because DS was one of “those” babies! They take them…between feeds at night! They don’t publicise it, but they can tell when a Mom is overwhelmed and they help out. They would take him until they knew he needed to feed then ring me to get him, then take him back. There is also an hour in the morning when nothing is scheduled and they have all the babies to bath them and you can leave them in between feeds at any point during the day. So you get some sleep. Makes sense. Actually, I’m now remembering the reason this didn’t work out for us with our non-sleeper, and it had to do with a big fight we had with the nursing staff over breastfeeding. But obviously if that doesn’t happen then it all makes sense. If a baby is bottle fed they will actually take the baby for the full night, if its needed. And then for the breastfed babies its a call to the room when the baby seems ready to feed. However, this last visit I went down to the baby room at 1am to get clean clothes for the baby after she spewed. The nurse that greeted me evidently thought I was going to ask them to watch her and I was met by an icy front, but once I told her I was just looking for clean clothes she was all smiles and chat! I don’t think they like people to leave them in unless they really need the sleep. I appreciate that. That sounds good. In our case it was the opposite – they *wanted* to take him into the nursery (and bottle feed him). It’s a long story, but the short of it was I didn’t end up getting a lot of rest until we went home, which sounds a bit backwards. Since then I may be sensitive to daytime interruptions at maternity hospitals!